Méthode Traditionnelle, or the Traditional Method, is the process that is used to make Champagne, as well as many other sparkling wines around the world. The method was originally known as Méthode Champenoise, or the “Champagne Method”. European Union regulations disallowed the use of the “method champenoise” label to prevent confusion with actual Champagne – which can only be made in the Champagne region of France. You may still see this label on bottles of sparkling wine from the New World. Traditional Method wines, along with Champagne, include Cremants from France, Cavas from Spain, Espumantes from Portugal, and Franciacorta from Italy, as well as many high quality sparklers from the New World. Unlike wine like Prosecco that use the Charmat method, Traditional Method wines are aged in bottle on the lees, giving them a rich flavor profile and mouthfeel. The first difference between wines using the traditional method and still wines is an earlier harvest. Winemakers want lower sugar and higher acid grapes for these wines. The grape juice is pressed quickly, then goes through a first fermentation to convert sugar to alcohol. No carbon dioxide is trapped for this fermentation – it’s done just like any still wine. The resulting high acid, dry, still wine is called the “base wine”. Many traditional method sparklers are blends. Champagne, famously, uses Chardonnay, Pinot Noir, and Pinot Meunier grapes. Each varietal will go through first fermentation by itself, producing a base wine for each grape that goes into the blend. Many producers will separately ferment grapes from different vineyards, or even plots in a vineyard. Some of these wines may be kept “in reserve” – saved for future vintages. After first fermentation comes assemblage – a blend is made from the base wines. Many Champagne houses and other producers will bring in “reserve wines” from previous vintages as part of the blending process. These winemakers are looking to reproduce their “house style” so that wine drinkers can expect the same taste profile year to year. Wines produced with reserve wine will be labelled NV for non-vintage. Many smaller artisanal producers use only wine from a single vintage. These wines will be labeled with a vintage year and will show variation from vintage to vintage much like most still wines. The blended still wine is called the cuvée. Now it’s time for the second fermentation, which give traditional method wines their bubbles. The cuvée is bottled, and additional yeast is added with a small amount of sugar called the liqueur de tirage. The bottle is crown capped and cellared on its side. Yeast will eat the sugar, producing more alcohol and carbon dioxide. The CO2 is trapped in the bottle, and then dissolves into the wine – creating those famous tiny bubbles. After fermentation is complete, the wine will age in the bottle with the dead yeast cells inside – or “on the lees”. This allows the wine to pick up flavors from the yeast, giving these wines their bread-like or even brioche characteristics. In Champagne, wines must be aged on the lees for at least 15 months, but many traditional method producers both inside and outside of Champagne will age for several years. 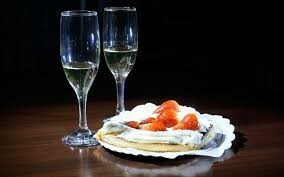 After the sparkling wine has been aged, the dead yeast cells need to be removed, or the wine will be cloudy. In 1816, Madame Clicquot developed the process called riddling, which is still used today. 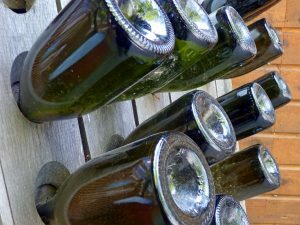 Wine bottles are placed in a rack in which they can be slowly tilted downwards from a horizontal position, traditionally by hand-turning them a small amount each day. Each turn tilts the bottle slightly more towards a 45 degree angle and pushes some of the lees towards the neck of the bottle. After several days or weeks, all of the lees are in the neck of the bottle, ready for the next step – disgorgement. To disgorge the bottles, the necks are first frozen. The crown cap is removed, popping out a plug of wine and yeast, and leaving clear wine behind in the bottle. Now the bottles are topped off with a touch of base wine called the liqueur d’expédition. This wine will usually also have a touch of sugar added called the dosage. 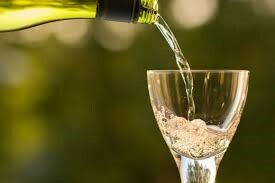 The amount of sugar in the dosage will determine how sweet the wine is – the sweetest wines are doux (“sweet”), followed by demi-sec (“half-dry”), sec (“dry”), extra-sec (“extra dry”), brut (“very dry”), extra brut (“extra very dry”), and finally wines with no dosage at all which are labelled brut nature, brut zero, or ultra brut. While often seen as something to sip alone in celebration of a big event, traditional method sparkling wines are very food friendly. The texture of the bubbles gives a body that pairs nicely with fleshy foods like meat or seafood. The high acidity pairs well with fatty or creamy foods. A sweet doux or demi-sec wine is amazing with deserts like cream pies or puddings. A sec, which translates as “dry” but still has plenty of residual sugar, goes very well with sweet fruits. Brut is the most common dosage level, and pairs well with pork or even beef, as well as salty foods – one of our guilty pleasures here at Bacchus is a nice brut with some potato chips! No-dosage brut-nature wines are bone-dry and go well with delicate foods like sushi.